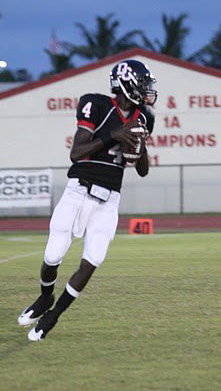 Bilal Marshall is one of the top quarterback prospects in the state of Florida and one of the top dual-threat prospects in the country. At 6’3” and 170 pounds, Marshall has a good frame and a natural athleticism that makes him an elusive playmaker. Several ACC programs are recruiting the standout signal-caller from Miami’s Dade Christian, and one school has stood out to him early. Highlights of his sophomore season can be viewed here. BDN: Can you start off by describing the strengths and weaknesses of your game for someone who hasn’t had a chance to see you play? Well, I play quarterback and I’m a dual-threat. When everything is locked up, nothing makes a defense more mad than when a quarterback goes and gets a first down himself. I can run the ball pretty well, I had over 900 yards rushing myself this year and I can throw the ball good. I think that I’m very accurate and I’ve got a good arm. That’s pretty much it there. BDN: Being a quarterback, is there a particular player in the NFL or in college that you compare yourself to or have studied closely? Well, right now it’s Darron Thomas, the quarterback for Oregon. I feel like we have a very similar type of play. BDN: What are some of the things you’ve been working on this offseason? Well the main thing the college coaches tell me is to keep working on my feet. They say my feet have gotten better from my sophomore year. I’ve gotten a lot better. They just want me to keep working on it so that it will help me make better throws. That’s the main thing I’m working on this whole offseason – footwork. BDN: I know you had a great year last season and made the playoffs. What are your goals for your team and yourself individually for the fall? For my senior year, number one is to win a state championship. I’ve got my last chance to do it. I want to probably have over 3,000 all-purpose yards, and try to mentor some of the young kids that’s coming in and try to help the legacy of my school keep going on. BDN: What are the most important things you are looking for in a college? Definitely academics. Whatever is going to fit me for my future because making it to the NFL is a one in a million chance, so that main thing is academics. BDN: Is there a particular field or program that you’re interested in academically? Right now it’s open. I don’t know yet. I’m still in the process of trying to figure out what I want to do in life. BDN: What schools have you recently heard from? Who were the first schools to contact you? Wake Forest has always been on top for me. They’ve been out ahead and coming to talk to me every once in awhile, coming to my school. I have a great bond with the recruiting coordinator, with Coach Ray McCartney. They offerd me early in my year. I have just recently got an offer from Duke and from Boston College. Right now, I feel like Wake Forest has really been after me and so has Rutgers. BDN: Which schools have you had a chance to visit so far? What schools do you definitely plan on visiting later this year? The only school I’ve been to is an unofficial visit to Wake Forest, I’ve been to one of their camps. I’m going to be going to a Junior Day at UM [Miami] this weekend and a Junior Day at Clemson April 9. And I’ll probably make the spring game for Wake Forest in late April. BDN: Are there any schools that you haven’t heard a lot from or that you’re hoping to receive an offer from soon? Definitely Clemson. I’ve grown up watching them play. I like to watch them play because of their explosive plays. I could definitely see myself in that program, but whatever happens, happens. BDN: You also mentioned that Rutgers, Duke, and Boston College have offered you. How much do you know about those schools and do you plan on visiting or learning more? Well it’s still early. I’m still trying to build a bond with those other schools. I’ve only talked to Duke maybe three times. Rutgers has been on me also, they’re probably right behind Wake Forest, with talking to me and being in contact with them all the time. Boston College I’ve only met the recruiter once, but they told me they’ll keep in contact with me. BDN: Do you have any plans for what camps you will attend at this point? Too early right now. I’m not sure if I will be attending any college camps, but it feels like probably the Manning Passing Academy, depending on financials. It’s an expensive trip. BDN: It’s still very early in the process, but ideally, when would you like to make your college decision? I’ll probably make my decision by Signing Day next year. I won’t be committing anywhere before then. BDN: Is there anything else that you think is important for college football fans to know about you? I’m just one person that’s willing to do anything for whatever program I’m with. I feel like I’m a great kid, I’m willing to help out anybody. And I just love to win, so whatever program I’m in, I’ll do my best to lead that team to 10 wins on the season or more. BDN: Thanks a lot, Bilal and best of luck to you. No problem. Alright, thank you sir.